By Stephen Sherman, Jan. 17, 2001. Updated June 24, 2011. After Amelia's flight across the Atlantic in 1928 succeeded in attracting even more publicity than her sponsors (Amy Guest and George Putnam) had expected, George organized a cross-country flight and a speaking tour for Amelia. While Putnam, a New York publicist, was married at the time, he was attracted to Amelia. He divorced his wife, and he and Amelia married in 1931. She was a charter member and first president of the "Ninety Nines," an organization of women in aviation, so named for the original number of members. 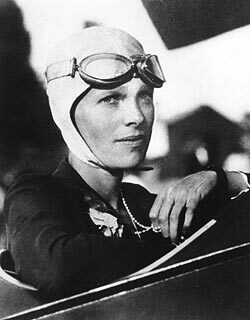 On May 21, 1932, five years to the day after Lindbergh's flight, she took off in a Lockheed Vega, in an attempt to become the second person after Lindbergh (and first woman) to fly solo across the Atlantic. Starting from Harbour Grace, Newfoundland, her flight lasted almost 15 hours, when she touched down in a pasture near Londonderry, Northern Ireland. 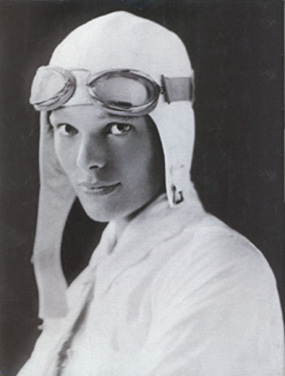 (In fact, the distance from Newfoundland to Ireland being considerably shorter than Lindbergh's route from Long Island to Paris, her flight time was correspondingly shorter than his 33 hours.) Her Vega 5B is on display at the Smithsonian NASM. January 11, 1935 - First person to solo the 2,408-mile distance across the Pacific between Hawaii and Oakland, California; also first flight where a civilian aircraft carried a two-way radio. She took off from Oahu's Wheeler Field; after an 18 hour flight, she landed at Oakland, with thousands of cheering fans to welcome her. 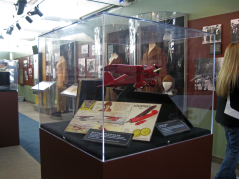 May 8, 1935 - First person to fly solo nonstop from Mexico City to Newark; 14hrs 19min. In 1935, she dedicated the new Administration Building at Newark Airport. 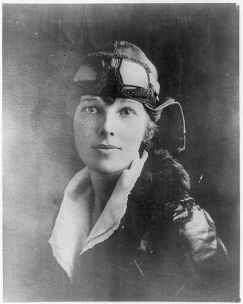 In 1937 Amelia Earhart attempted an around-the-world flight. 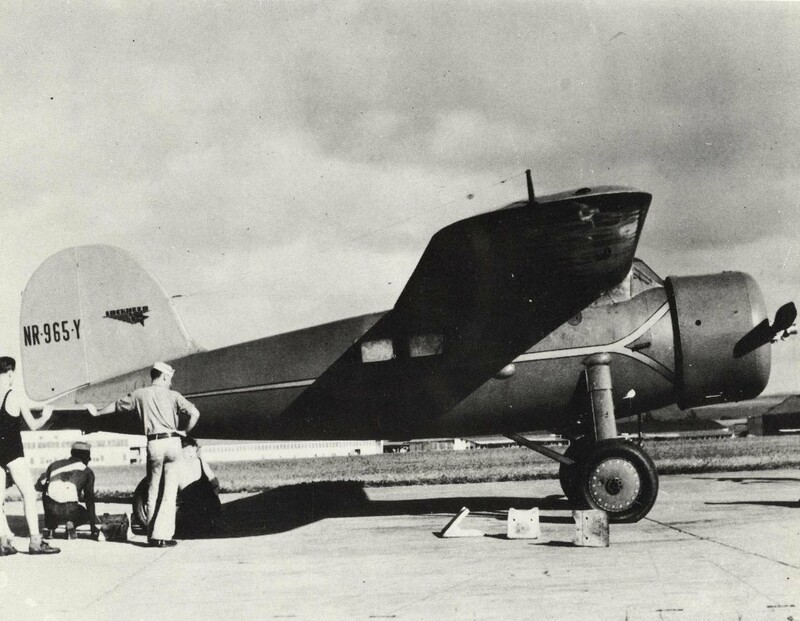 Flying a custom-built Lockheed Model 10E Electra, equipped with extra-large gas tanks, she would follow a 'close to the Equator' route, thus going one better than Wiley Post's northern, mid-latitude route. In her first effort, in March of 1937, she flew west, but a crash in Hawaii abrubtly ended that trip. Starting on May 21, 1937 from Oakland, California, in the recently repaired Lockheed Electra, she and her navigator, Fed Noonan, stayed over land as much as possible. After relatively short flights to Burbank, California, and Tucson, Arizona, they next touched down in New Orleans, and then Miami where the airplane was tuned-up for the long trip. From Miami, they flew through the Caribbean, to an enthusiastic welcome in San Juan, and then to Natal, Brazil, for the shortest possible hop over the Atlantic, although, at 1727 miles, it was the longest leg of the journey that they completed safely. They touched down in Senegal, West Africa; then eastward across Africa (via the dusty Sahal outposts of Gao, N'Djamena, and El Fasher) to Khartoum and then Ethiopia. From Assab, Ethiopia, they were the first to make an Africa-to-India flight, touching down in Karachi (then part of India), a 1627 mile leg. From Calcutta, India they flew to Rangoon, Bangkok, and then Bandung, in the Dutch East Indies (now Indonesia). Monsoon weather prevented departure from Bandung for several days. Repairs were made on some of the long distance instruments which had given trouble previously. During this time Amelia had become ill with dysentery that lasted for several days. After a stop in Darwin, Australia, they continued eastward to Lae, New Guinea, arriving there on June 29. From Lae, they took off for Howland Island, 2200 miles away in the Pacific. They never arrived. May 21 Oakland, California Burbank, California 283 .
. Burbank Tucson, Arizona 393 .
. Tucson New Orleans, Louisiana 1,070 . June 1 Miami San Juan, Puerto Rico 908 June 3 photo taken at S.J.?
. San Juan Cumana, Venezuela 492 .
. Cumana Paramaribo, Suriname 610 .
. Paramaribo Fortaleza, Brazil 1,142 .
. Fortaleza Natal, Brazil 235 .
. St. Louis, Senegal Dakar, Senegal 100 .
. Dakar Gao, Mali 1,016 .
. Gao N'Djamena, Chad 910 .
. N'Djamena El Fasher, Sudan 610 .
. El Fasher Khartoum, Sudan 437 .
. Khartoum Massawa, Ethiopia 400 .
. Massawa Assab, Ethiopia 241 . June 16-17 Karachi Calcutta, India 1,178 .
. Calcutta Sittwe, Burma 291 .
. Sittwe Rangoon, Burma 268 .
. Rangoon Bangkok, Thailand 315 .
. Bangkok Singapore 780 . June 27 Bandung Surabaya, Indonesia 310 .
. Surabaya Kupang, Indonesia 668 .
. Kupang Darwin, Australia 445 .
. Howland Island Honolulu, Hawaii 1,648 .
. Honolulu Oakland, California 2,090 .
. Total Miles 24,557 . "KHAQQ calling Itasca. We must be on you but cannot see you...gas is running low..."
"We are in a line position of 157- 337. Will report on 6210 kilocycles. Wait, listen on 6210 kilocycles. We are running North and South." 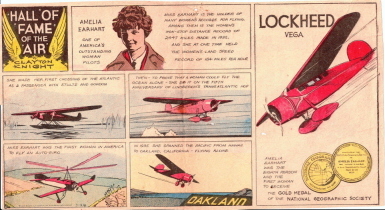 Ironically Amelia Earhart has become more famous for disappearing than for her many real aviation achievements. It sparked a whole cottage industry of conspiracy theorists and "researchers." There are two main themes to these ideas. One, her around-the-world flight was a cover for a spy mission, commissioned by President Roosevelt to determine what the Japanese were up to in the Pacific. Two, she and Fred Noonan weren't simply swallowed up by the vast Pacific Ocean, but were captured by the Japanese. Obviously these two main themes work well in combination. No evidence has ever been found to support either one of these ideas. But a lack of facts has not dissuaded these researchers. In March, 2011, as part of the never-ending search for Amelia Earhart's remains, researchers examined the DNA of bones found on Nikumaroro, and determined that they might or might not be remains of the famous aviatrix. In fact, the researchers could not even state with certainty that the small bone fragments in question were human. 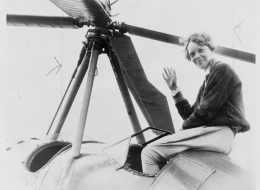 Amelia Earhart left a rich legacy; she continues to be an inspiration, not only to women, but to all who seek to explore and push their own limits and the world's boundaries. Several schools across the country have been named in her honor. "Courage is the price that life exacts for granting peace. The soul that knows it not, knows no release from little things; knows not the livid loneliness of fear." "Flying might not be all plain sailing, but the fun of it is worth the price." "In soloing - as in other activities - it is far easier to start something than it is to finish it." "The woman who can create her own job is the woman who will win fame and fortune." "There is so much that must be done in a civilized barbarism like war." "Women must pay for everything. They do get more glory than men for comparable feats, but, they also get more notoriety when they crash." 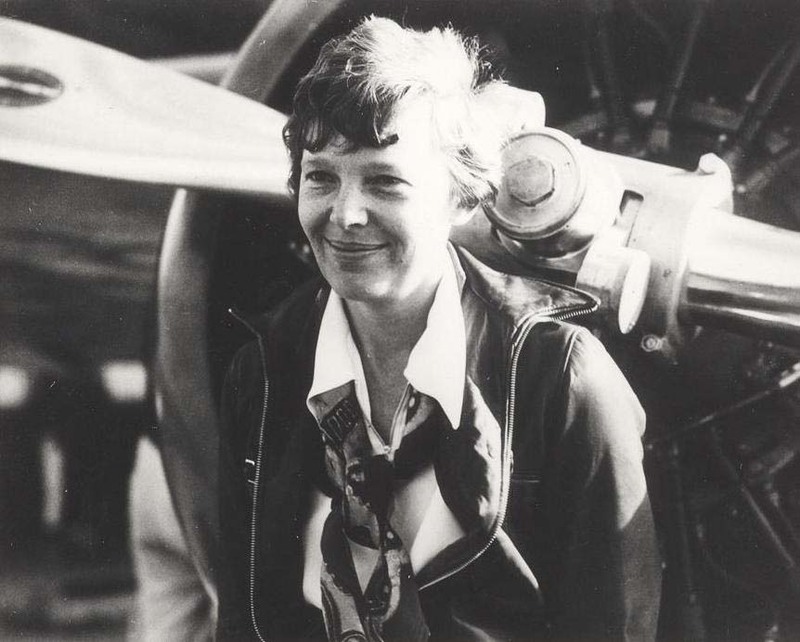 In 1994, the made-for-TV movie Amelia Earhart: The Final Flight, starring Diane Keaton and Rutger Hauer (as Fred Noonan), dramatized the story of her last flight. But it played fast-and-loose with the facts, playing to all the myths related to her disappearance. One IMDB commentator called it "a conspiracy-theorist's fantasy extravaganza." In 2009, Hilary Swank starred as Amelia, in the movie by that name, and Richard Gere co-starred. This movie is more of a biopic, focusing on her difficult relationship with her husband, George Putnam (played by Gere).